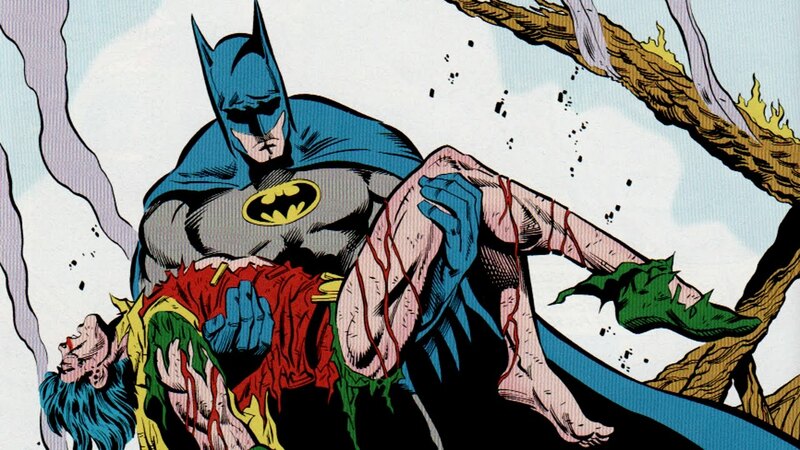 Gobbledygeek episode 340, “Batman: A Death in the Family (feat. Kenn Edwards),” is available for listening or download right here and on iTunes here. For the (belated) inaugural installment of Four-Color Flashback 2018, wherein Paul and Arlo will be discussing a different classic superhero story each month, they’ve recruited their old pal Kenn Edwards to help them discuss Batman: A Death in the Family by writer Jim Starlin and artist Jim Aparo. Kenn knows a thing or two about the Caped Crusader, having been part of the Batman Immortal fan film project. However, he’s never read this particular story, in which the Joker savagely beats Robin to death. That puts him on equal footing with our hosts: it’s one of Arlo’s blind spots and Paul hasn’t read it since it was published in 1988. They’re all a little shocked by how anachronistic its goofy plotting and dialogue seem given its release in a post-Dark Knight Returns landscape. Superhero comics were starting to mature, and this one feels like it may have gotten left behind. The gang discusses the impact of Robin’s death; whether Bruce’s hypocrisy is a bug or a feature; the ludicrous political implications of the Joker’s scheme; and why the follow-up story A Lonely Place of Dying is much better. Plus, Arlo is still watching Disney cartoons. Next: be vewwy, vewwy quiet. The boys and their pal Nate Curtiss are hunting Krasinskis for a discussion of A Quiet Place. Last summer, I started a column entitled Four-Color Flashback, wherein I went through and discussed/analyzed a legendary run of comic books I’d never read. In that case, it was Chris Claremont and John Byrne’s Uncanny X-Men (read the first part here). It was a fun experience, and toward the end of the column, I stated the desire to return to the concept “some time in the next century.” That time is now! Unlike last year, which was just me rambling on endlessly by myself, this summer, I’m joined by Paul to discuss Garth Ennis and Steve Dillon’s notorious Preacher. Paul is a huge fan, and I’ve never read a single issue, so we’re both bringing different perspectives to the table. The series lasted for 66 issues from 1995 to 2000, and has subsequently been collected in nine trade paperbacks. We’ll be going through them one at a time, starting this week with Preacher: Vol. 1 – Gone to Texas, collecting the series’ first seven issues. So pull up a chair, do your best John Wayne impression, and enjoy.